How Long Can You Safely Ride a Motorcycle in One Day? How to Determine How Long Can You Safely Ride a Motorcycle in One Day? Ah, the lure of the motorcycle. It’s tremendously fun to think of taking either a short or long trip on one. Say your best friend lives 400 miles away. In a car, that’s roughly 8 hours. A stretch, but you could make it in one sitting. Could you make it on your motorcycle? How long can you safely ride a motorcycle in one day? Here are some answers and considerations to think about. Riders vary in how many miles they can ride and feel comfortable—both when they dismount from the bike and the next day. Remember, you are sitting for a long time in one position. That can cause muscle cramp or soreness. Say you have planned a 400-mile trip. The last thing you want is to be stiff and sore after stopping for lunch, or when you wake up the next day. So, be practical. Don't just start out on a long trip without riding practice runs first. Start with a conservative number of miles before setting out on a lengthy trip. If you’re sore, realize the amount of miles you can drive per day is going to be less than the mileage that made you sore. If you're sore after a 100-mile ride, say, decrease by 10 miles until you find your comfort level. 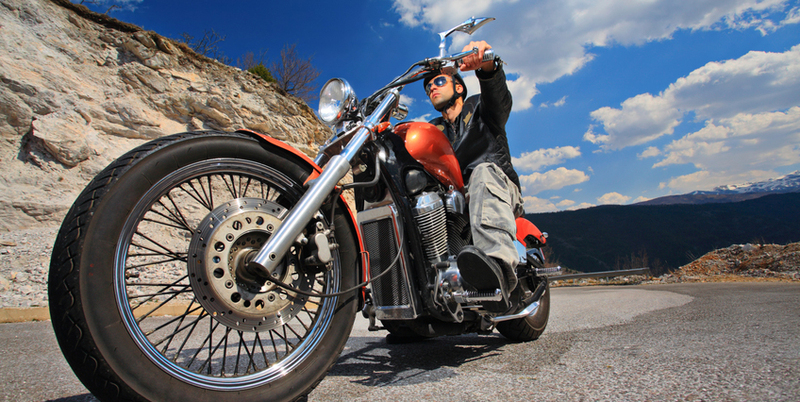 Heavier motorcycles, such as Harley-Davidsons, are better for long cruises. Make sure your bike can take the wear and tear of a long trip—and that you can take the wear and tear on it. Do trial runs, as above: determine how long you can comfortably ride. Also, remember that on a long trip, you will be hearing the noise of your bike much more than you hear the noise of a car on a long trip. Will that bother you? Will the vibration from the motorcycle? Again, test runs (start with 50 miles and work up) are key here. Use ear-plugs for the noise factor. As the experienced cyclist here notes, the ideal motorcycle seat is hard (not soft), long, and relatively flat. Why is this the ideal shape? Simple. It allows you to move your body around to various postures rather than essentially making you sit in one place, as an indented seat does. Being stuck in one posture can become agony in anything you do. You need options, always. So we have checked the ability of you, your motorcycle, and your motorcycle seat to be long-distance-worthy. But no amount of distance is safe unless there are favorable safety conditions. Yes, we are talking weather, traffic, and road conditions. If heavy rain is forecast, you are going to have to slow way down, and it might even be prudent to get off the road. Ditto tornadoes, thunderstorms, snow…and a whole host of inclemencies. If traffic is snarled, whether due to an accident or construction, simply incorporate it into your plan and realize you will not make your goal miles. Do not sweat it or become impatient. Trying to beat the traffic or swerve around traffic is not safe. If there is construction, or the road is bad for some reason (rocks, sand, other impediments), again, do NOT make your commitment to mileage or making it to a certain place cause you to drive unsafely. Nearly half of all motorcycle fatalities are caused by speeding, according to Consumer Reports. Don’t try to go faster than road conditions allow, for any of the reasons above. So there you have it. How long you can safely ride a motorcycle depends on your mileage tolerance, your bike, and weather, roads, and traffic. Ride on!